So I wanted to share with you all some of the awesome games that I love to play on my gaming laptop & I wanted to share some of my favorite YouTubers that do a "Let's Play" series on them. So first off, we will start off with Another Brick in the Mall. This game is pretty awesome! You basically build some stores and other things such as a theatre or bowling alley or a fast food restaurant if you want and have it all in a mall or you can change it up and do it like a strip mall etc. This game is on Steam in the Early Access program where you can buy the game and the developers are still making it better and updating it as the days and weeks go on. I love these kinds of games because you can see how it first started and how far its come. I love this game! I also love this newer game that is also out on Steam in the Early Access called Sim Airport. You can see in the video below that you build an airport and schedule the planes etc. Love it! Completely addicting! #SurvivorGameChangers --- LOVE this season! 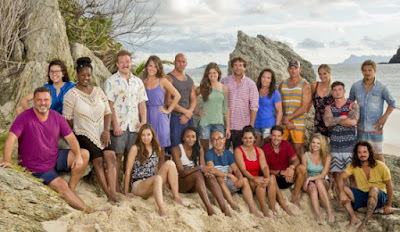 So not to long ago Survivor started a new season called Game Changers. I absolutely love this show! I've watched since season 1! So when I saw that it was coming on again of course I made sure that my Wednesday nights included watching Survivor. I was going for 2 guys that were BOTH my absolutely fave ones darn it and sad enough they are both gone now!! I was rooting for Caleb since he got taken out last time because of a medical emergency which was pretty scary! And sad enough he got taken out on the 9th day I believe it was again this season ... hoping that whatever they do for the next season of Survivor that Caleb can and will be a part of it! I think he has potential if they would just give him a chance! I was also rooting for Malcolm. Not only is Malcolm a hottie but, I just liked the way that he plays the game. I have always loved those 2 so when they were voted out I was ticked! I am SO in love with this show!! I am so sad to see it be done for the season 2 darn it! I'll have to wait (not so patiently) LOL for the season 3 to get here next year! Title: Hammered Series: Steel Country #1 Author: MJ Fields Genre: Contemporary Romance Release Date: April 24, 2017Photographer: Wander AguiarCover Model: Jonny JamesCover Designer: Jersey Girl & Co. Divorce. Divide. Gage Falcon's life is turned upside down. When backed against a wall, he does what men with 'Steel' convictions do...take control. Fight. Strength. Phoenix Star knows it's going to take everything inside her to be who she is destined to be. Fresh out of college and knowing she can't go home and get where she wants to get, she takes the path less traveled. Redefining life sends them both down a long dirt road to...become. What happens when two people starting over in life and needing to find some control come face to face? They get...HAMMERED!